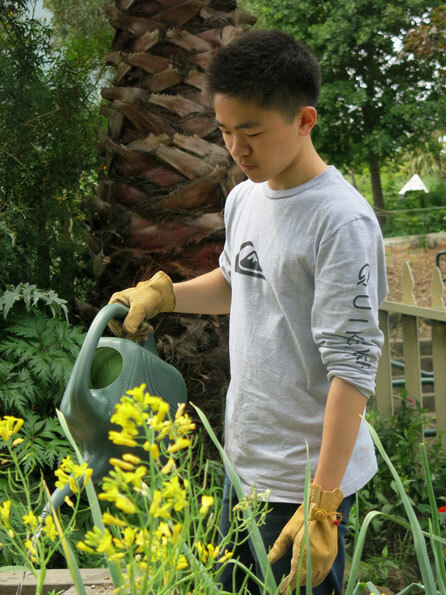 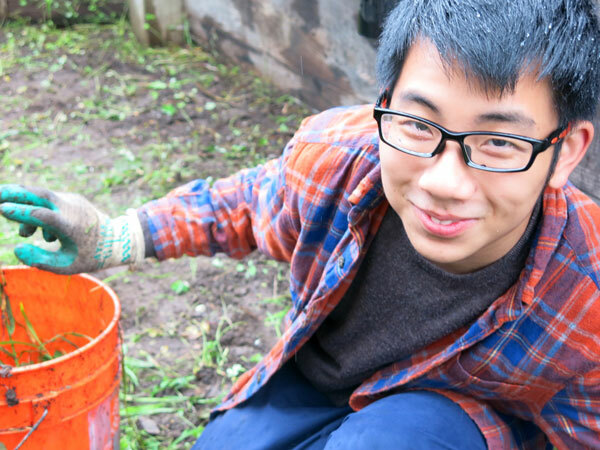 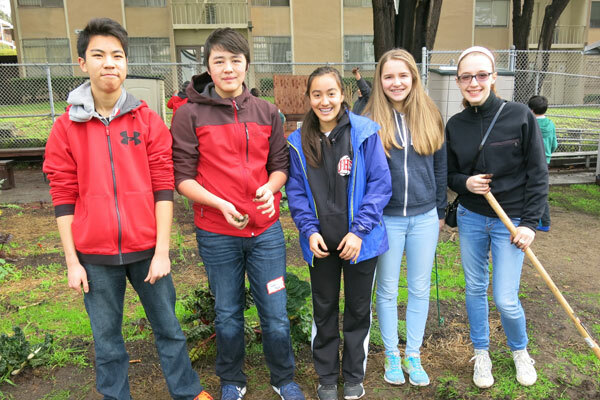 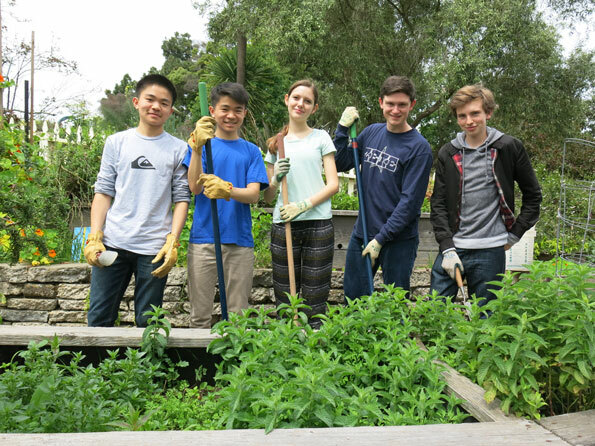 On Saturday, April 22, 2017 CommunityGrows celebrated Earth Day with students from International High School in Koshland Garden. 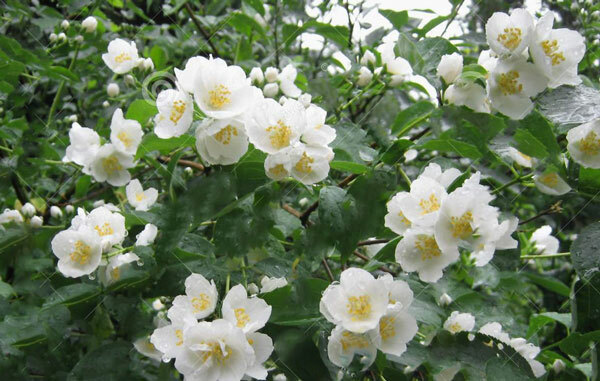 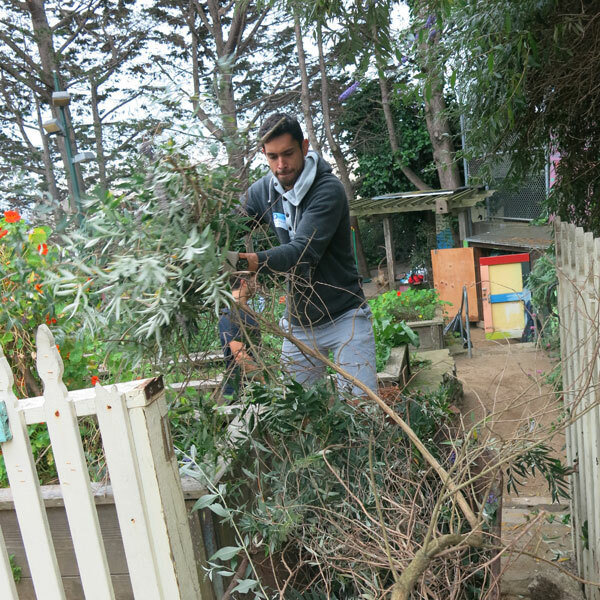 It was a great day of weeding, pruning, planting and cleaning up the garden for the summer. 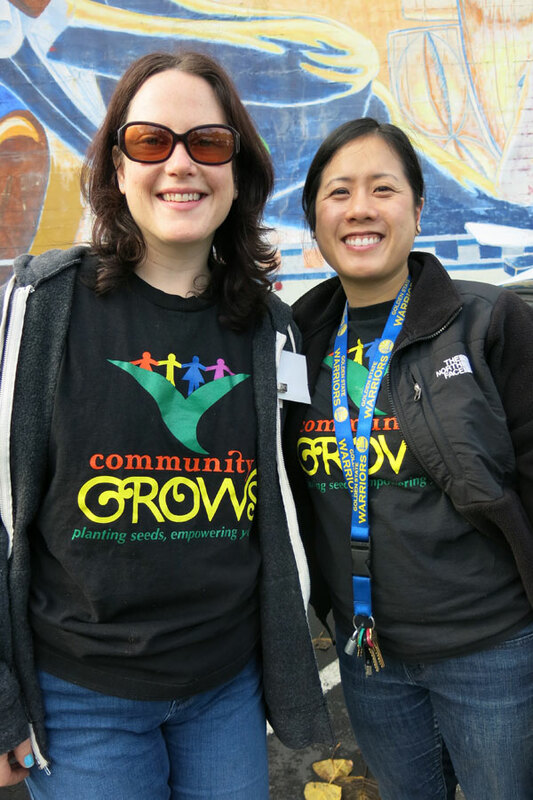 We were also happy to have two of our Advisory Board members Sarah Penney and Catheline Leung join us. 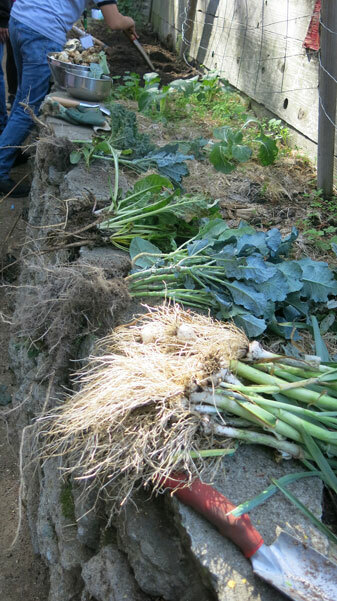 Paul Bergkamp led the crew through mulching the vegetable beds and composting. 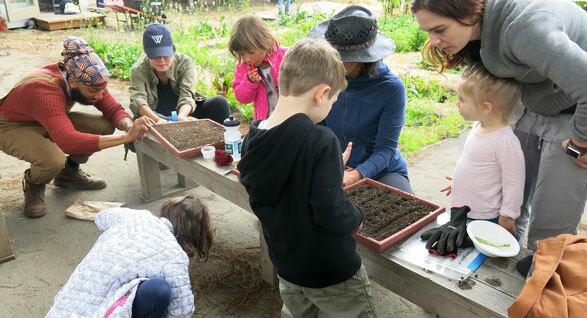 Great day to celebrate being outdoors and give thanks to the earth! 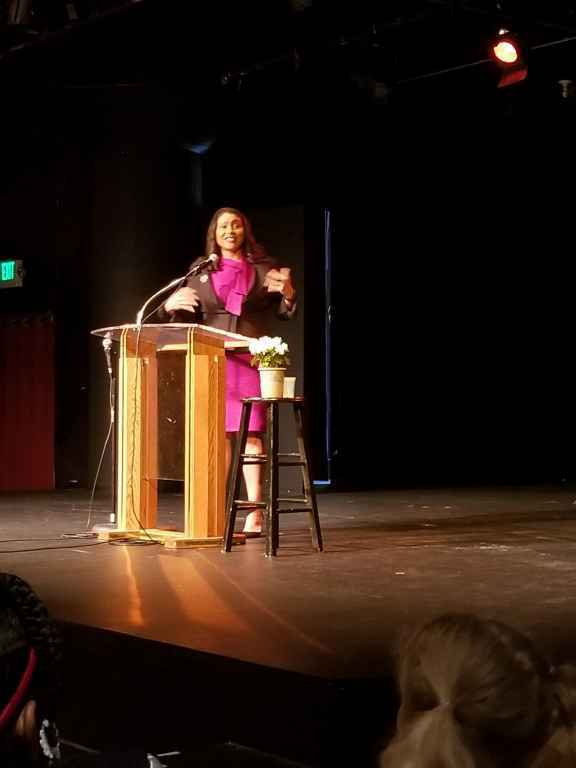 Thank you International High School and Sarah and Catheline! 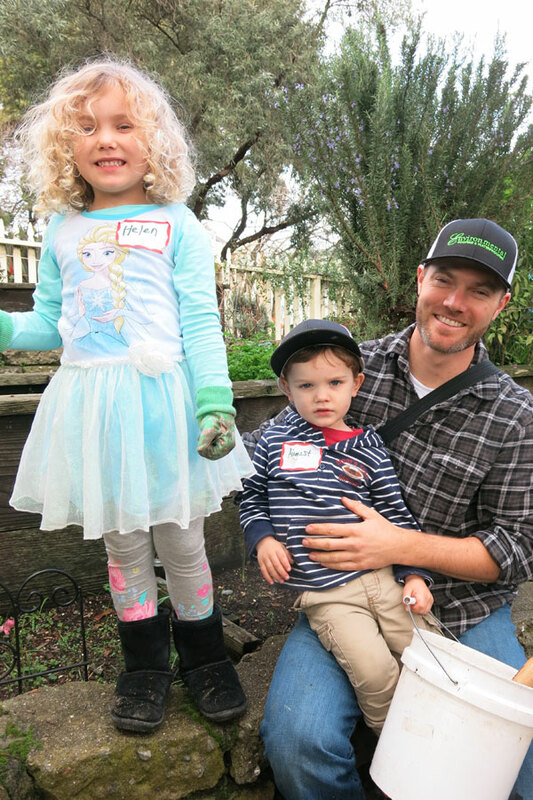 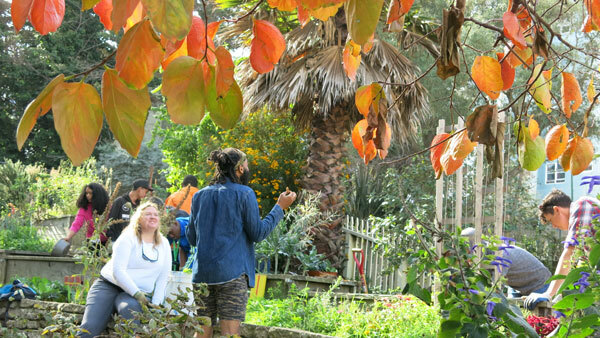 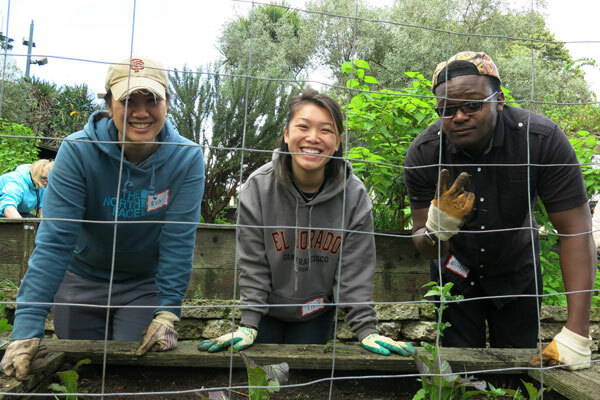 On Saturday November 5, 2016 CommunityGrows held a workday in Koshland Garden to celebrate our partnership with Avila & Associates, and Friends of the Urban Forest (FUF). 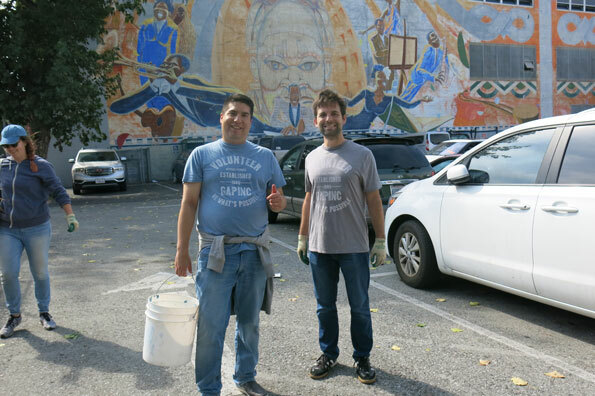 Avila and Associates provides provides civil engineering, environmental services, and water resources engineering services to public agencies at the federal, state and local level; private property owners; civil engineering professionals and other professional service firms. 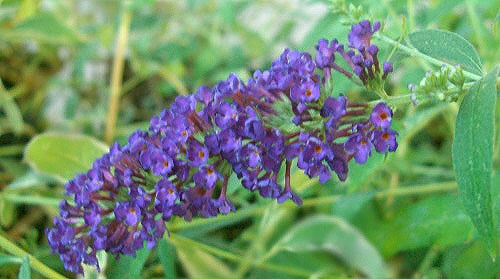 One of the many environmental services they provide is field surveys and regulatory reporting. 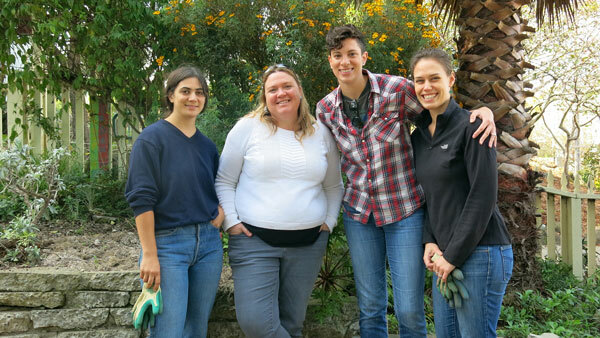 Leanne Feely-Botanist, Sarah Flaherty-Wildlife Biologist, and Rachel Spadafore-Ecologist/Senior Project Manager, all participants in the workday, do this research. 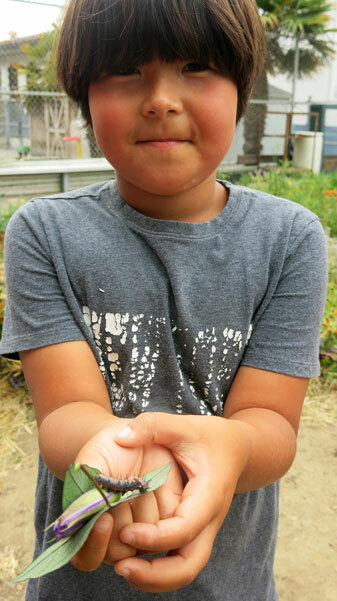 They talked with many of the BEETS about what they do and how they are working to save different endangered species. 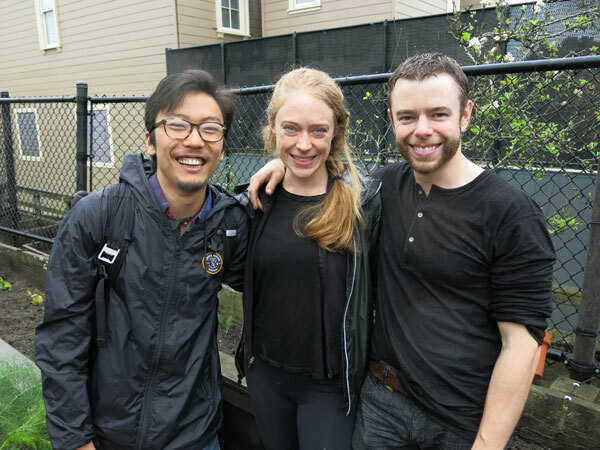 Here they are with volunteer Janine Kaiser. 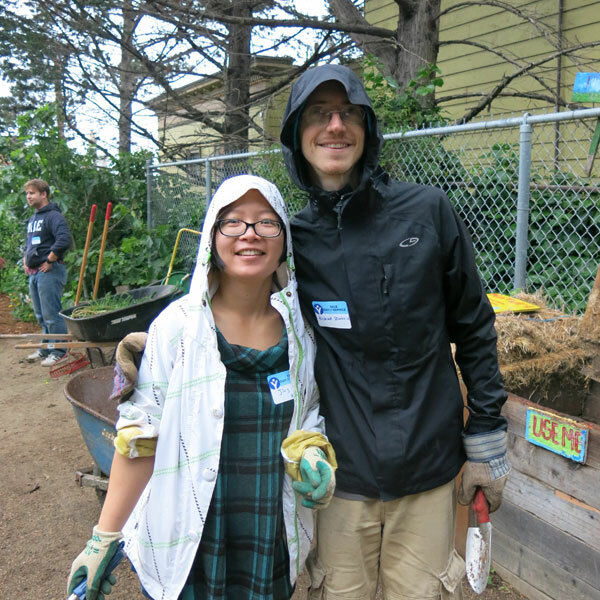 The morning started with introductions and welcomes from staff members Jay Jordan, Garden Educator, and Melissa Tang, BEETS Program Manager. 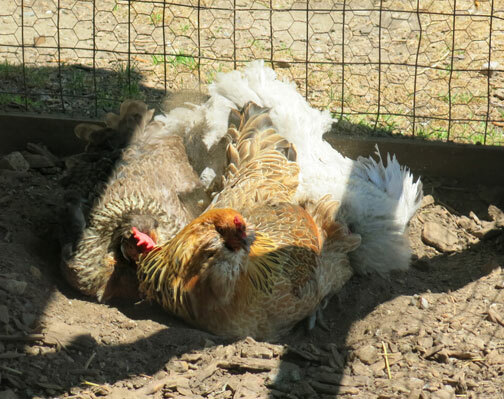 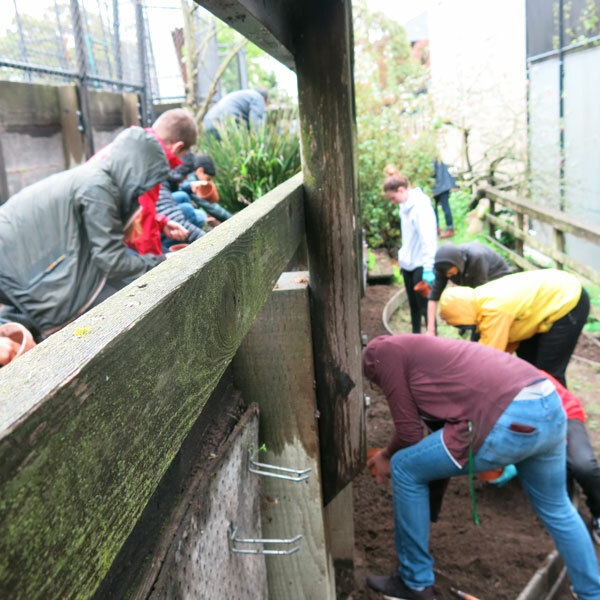 Then people commenced to flipping compost, trellising peas, weeding the mustard and strawberry beds, collecting leek seeds, thinning radishes and preparing bed for the BEETS to plant starts. 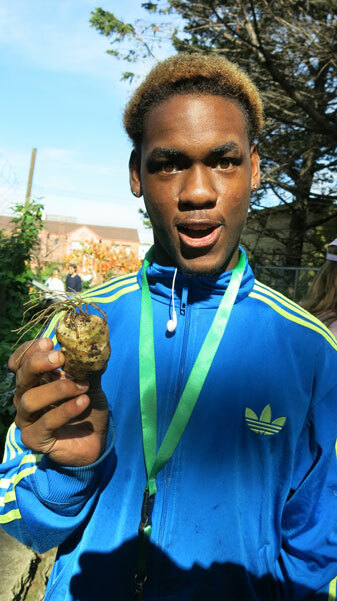 Lots of Jerusalem Artichokes, onions, collards, kale and herbs were also harvested. 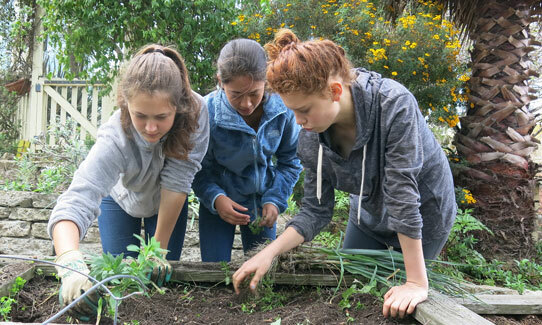 Sarah Penney-CommunityGrows Advisory Board member, Emily Danford-CommunityGrows office/communications volunteer, and three wonderful students from University High School (Judith Edwards, Joley Costa, and Nicole Cuthbert) also helped out in the garden. 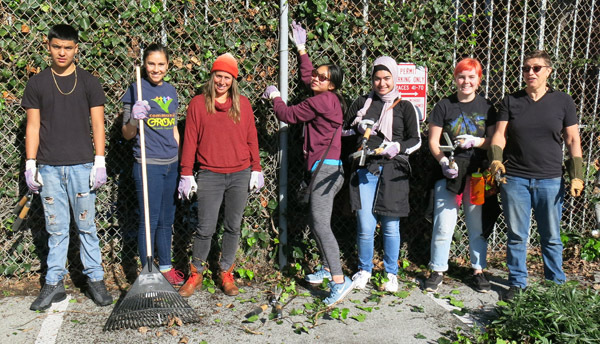 At 1:00 PM the volunteers were joined by a group of youth from Friends of the Urban Forest, who led a workshop in pruning trees. 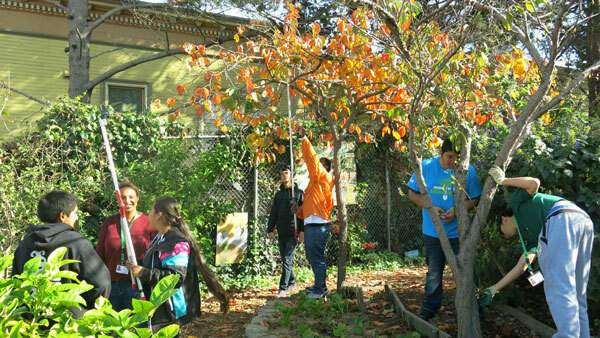 Alex Javier, Education Coordinator for FUF, talked about the essentials of pruning and tree care, the types of cuts to make, proper pruning techniques, and equipment safety. 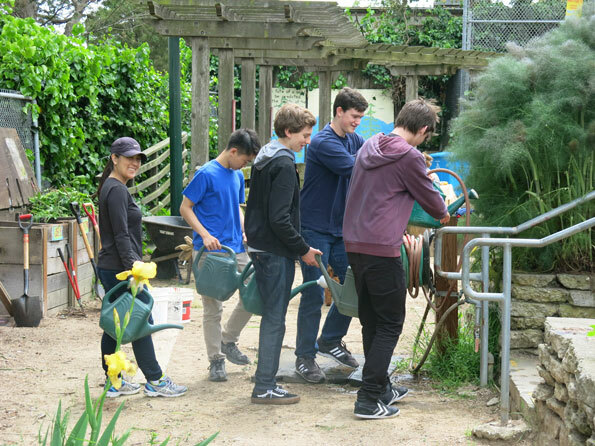 Then the youth went off to the orchard to trim back and prune the fruit trees. 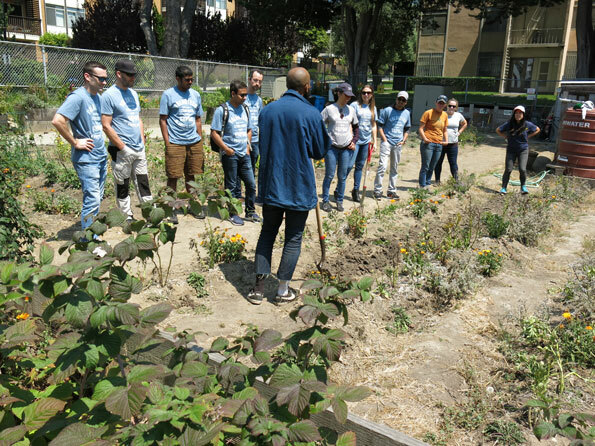 It was an amazing workday with lots of knowledge gained about the environmental field and how to care for the earth through the pruning of trees. 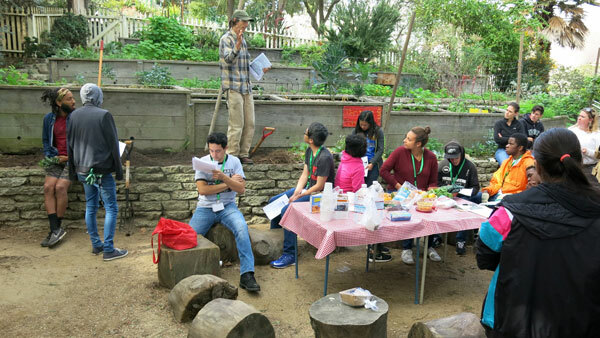 Thank you Avila & Associate and Friends of the Urban Forest for a very engaging and worthwhile day. 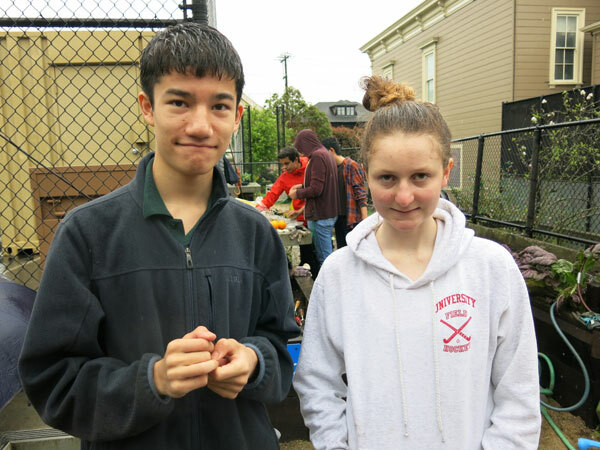 For more photos, check out our Flickr Photostream here. 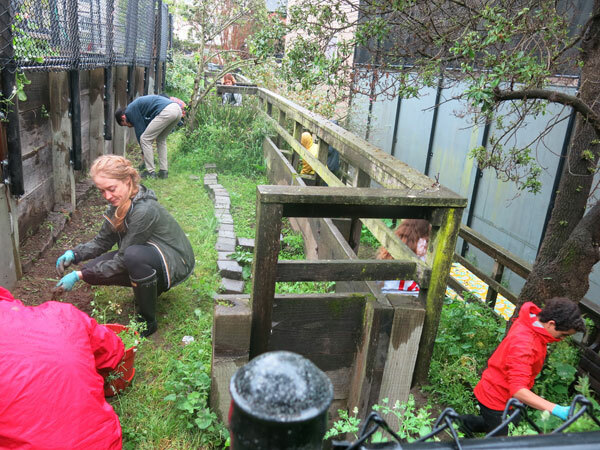 We love the rain! 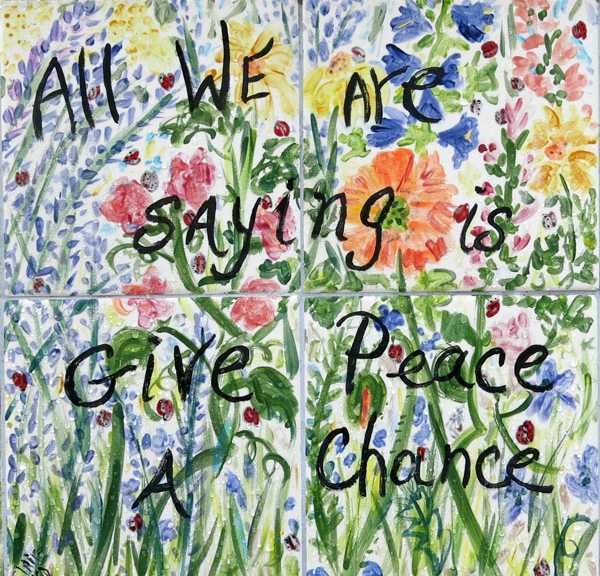 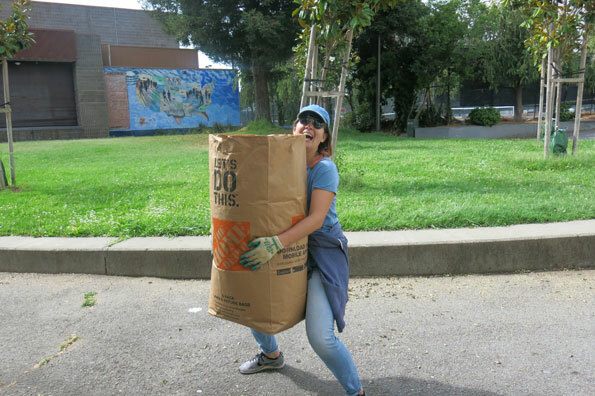 Even when there’s a workday in Koshland Park and Garden. 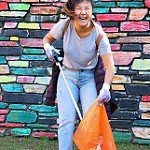 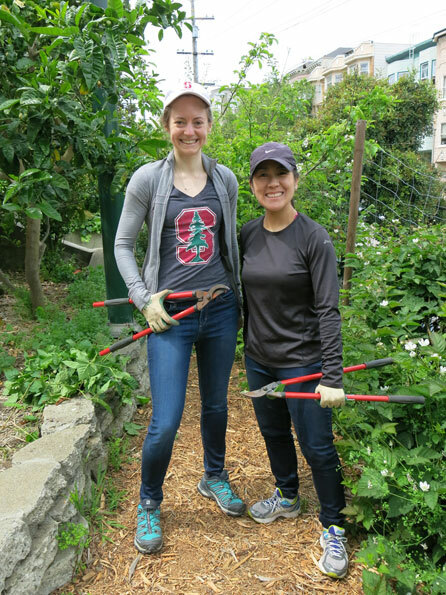 On Saturday, May 7th eighteen volunteers from the Yale Alumni group came out to help us spruce up the park and garden. 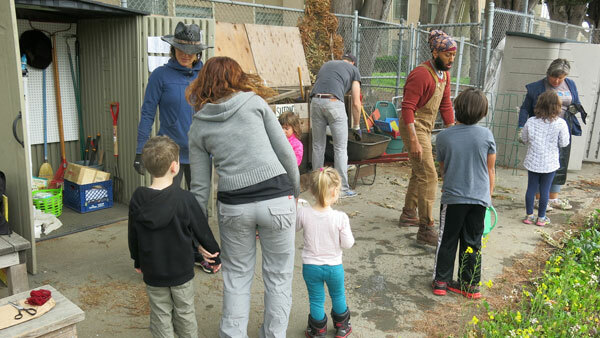 Besides helping Freddie Ealom, our Recreation and Park Garden in the upper park, everyone took on the tasks of composting, weeding, moving mulch with wheelbarrows,removing debris, picking up trash, weeding strawberries, and pruning the Mock Orange and Black Knight Butterfly Bushes that grace the entrances to the garden. 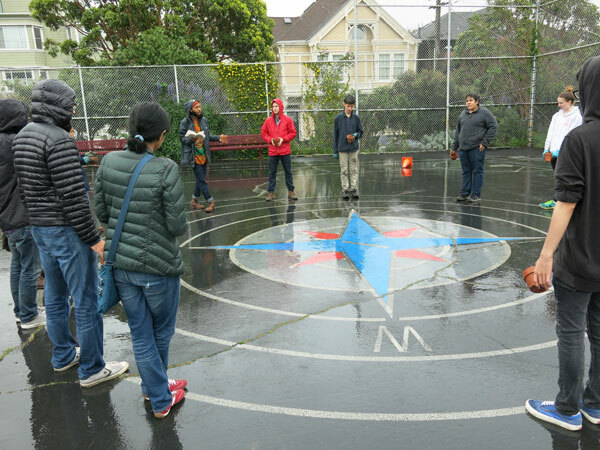 Everyone was in a jovial mood, and after an hour and a half, we got done early, just before the rain really started to come down. 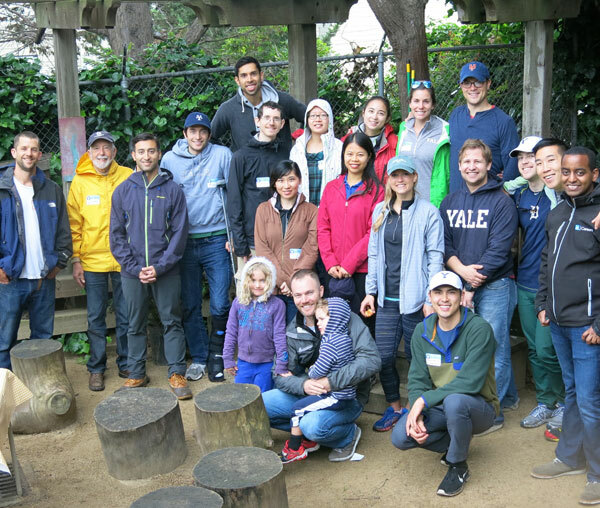 Thank you Yale Alumni for making the day a great success! 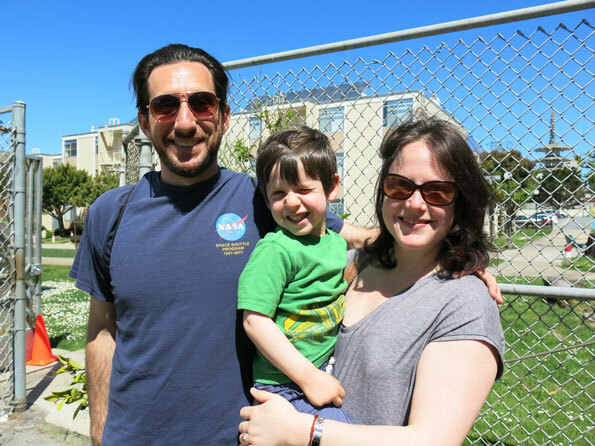 For more photos see our Flicker Photostream here. 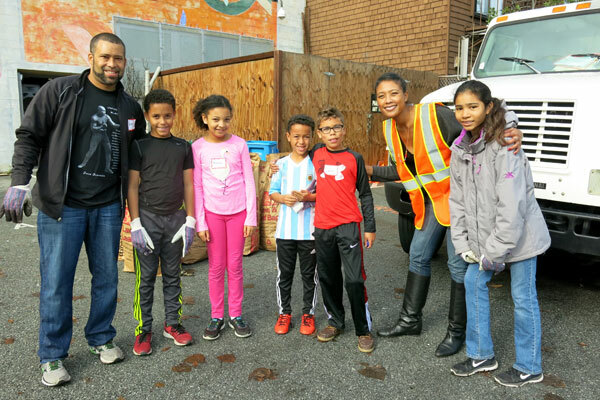 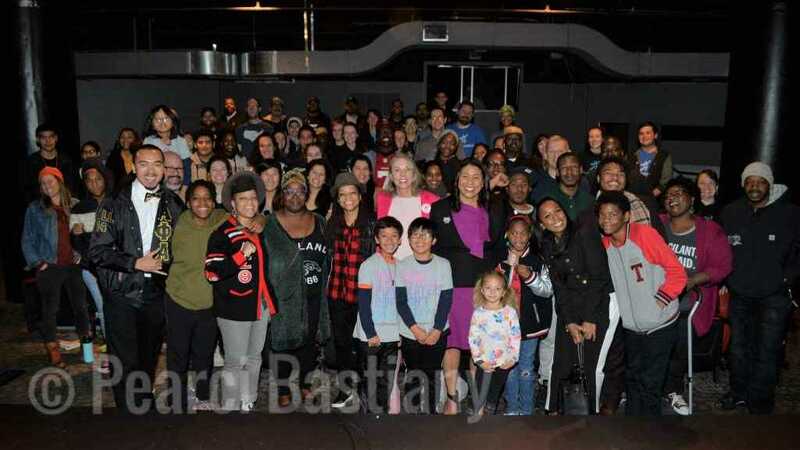 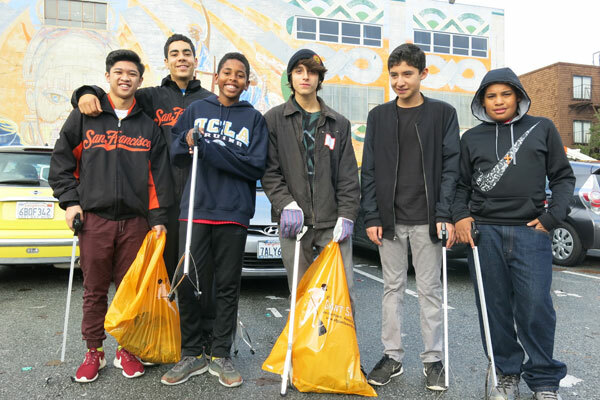 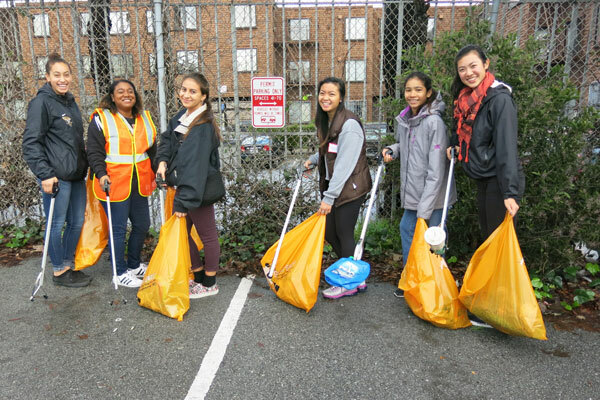 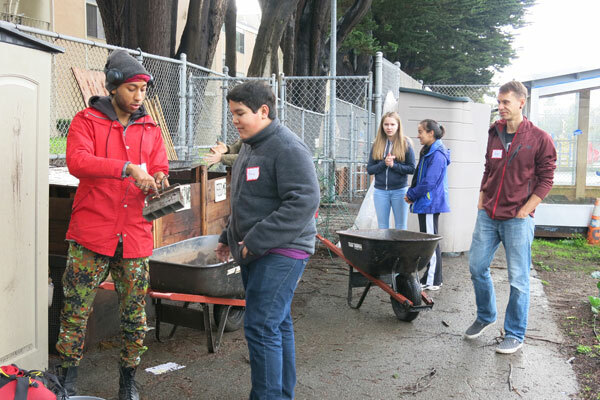 On Monday, January 18, 2016 over 90 volunteers came out to celebrate Martin Luther King Jr. Day of Service. 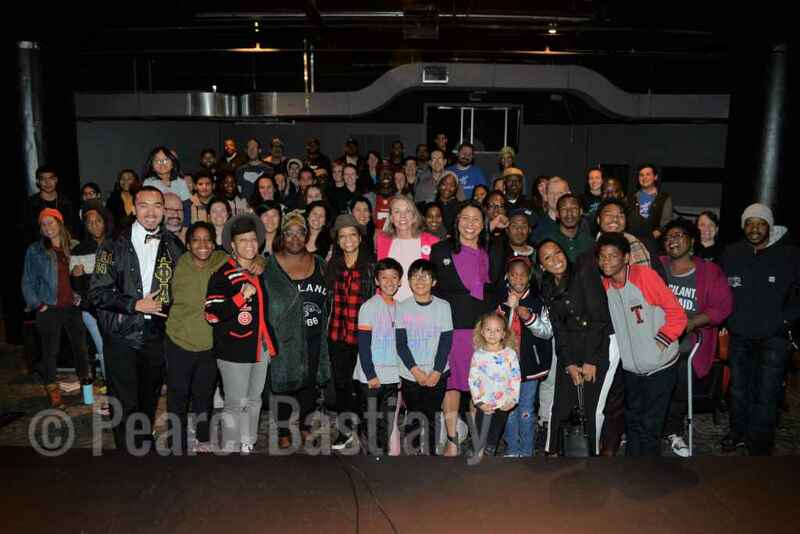 This event was sponsored by the African American Arts and Culture Center (AAACC) and CommunityGrows. 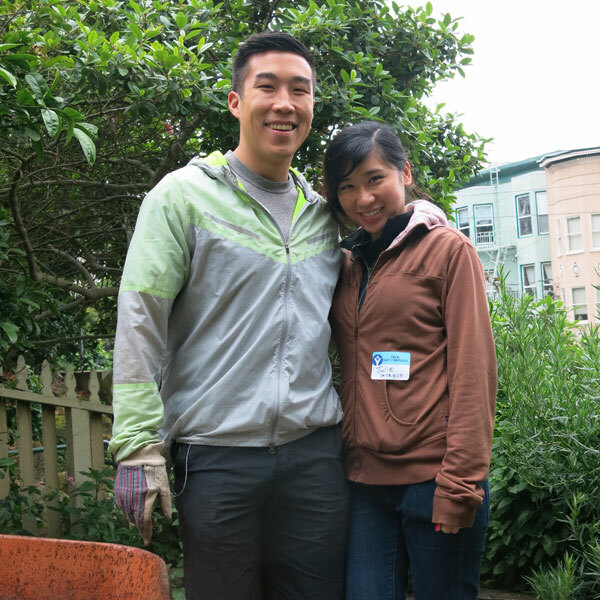 Volunteers began arriving at 8:30 AM on a morning reprieved from the wonderful rain we’ve been having in the Bay Area. 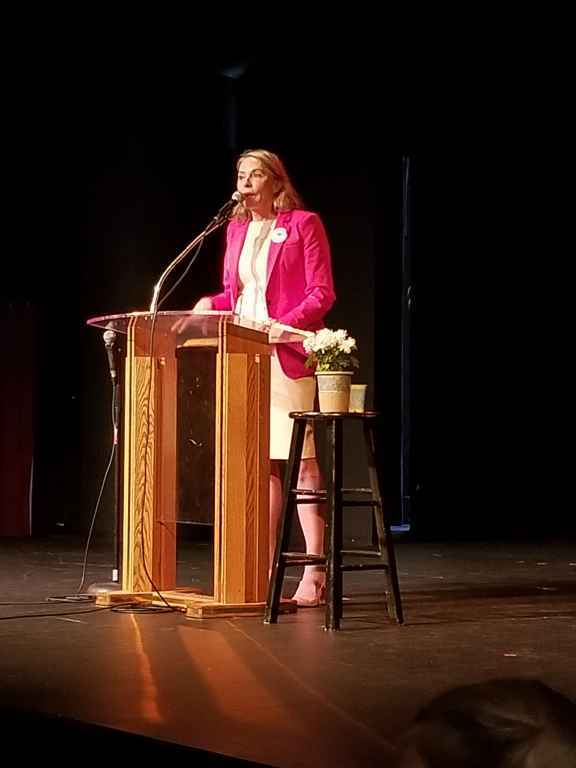 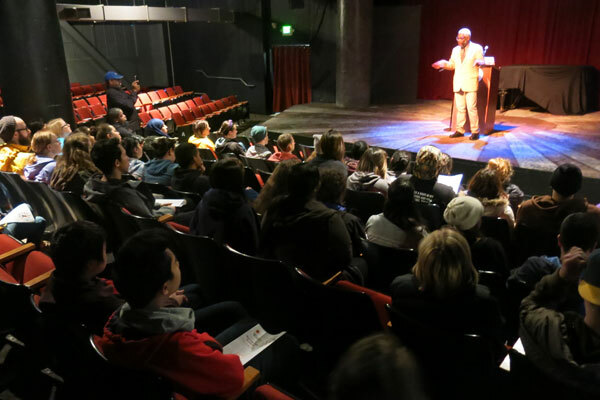 After a light breakfast of bagels and coffee, Mohammed Soriano Bilal, Director of the AAACC directed everyone to the buildings Burial Clay Theatre to hear an inspirational talk by John William Templeton. 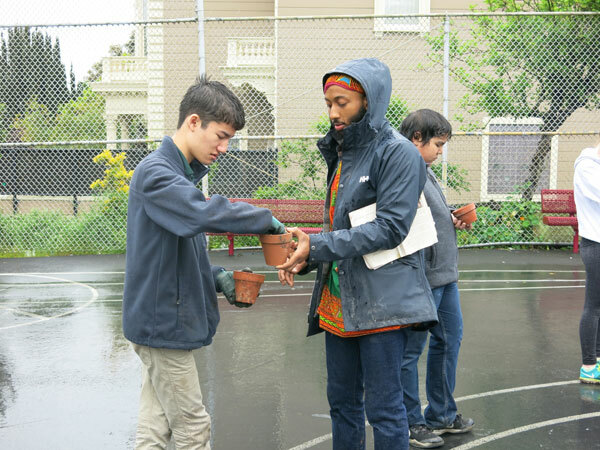 Mr. Templeton curated a African American Freedom Trail brochure which leads visitors to the various historic landmarks, such as the Third Baptist Church of San Francisco founded in 1852, that illustrate the remarkable contributions of African-Americans to the city. 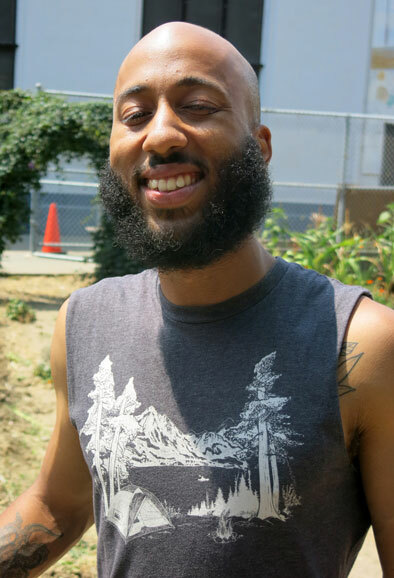 He is also the author of “Come to the Water: Sharing the Rich Black Experience in San Francisco,” “Our Roots Run Deep: The Black Experience in California” and other books. 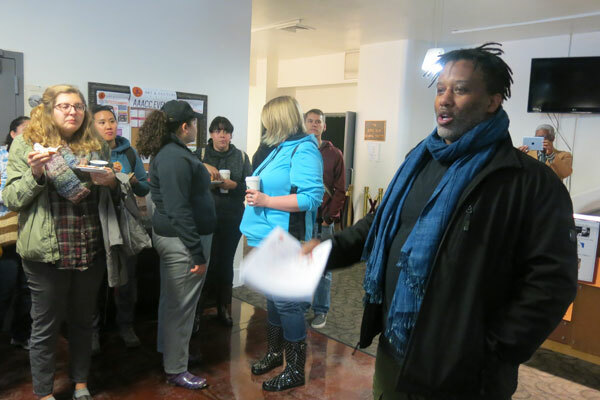 He is founder of ReUNION: Education Arts Heritage, an instructional video network designed to provide culturally responsive curriculum to schools globally. 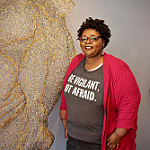 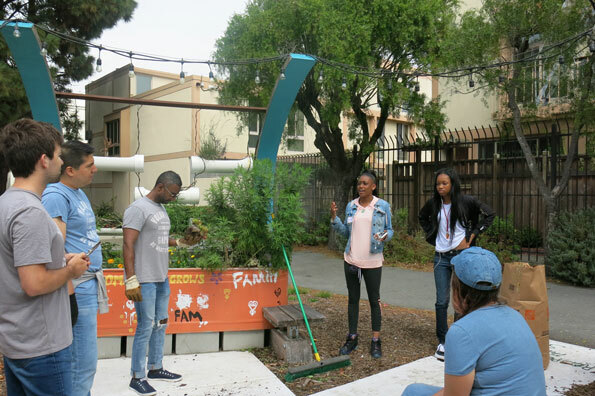 Templeton also operates SF Soul Shuttle tours which bring the African American history and culture of San Francisco, including where to dine, meet, shop and worship. 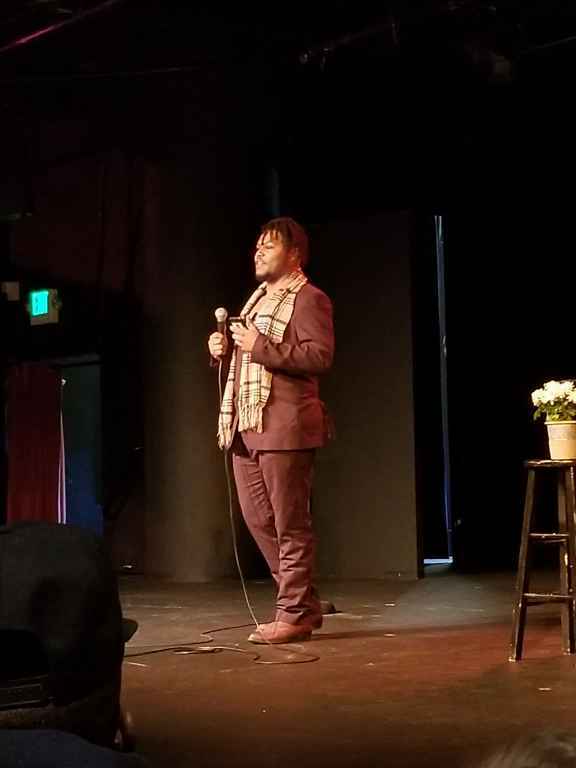 He spoke about Martin Luther King coming to San Francisco and his importance for the African American community. 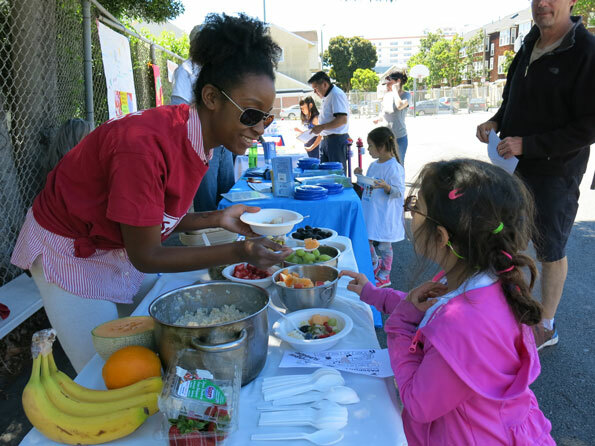 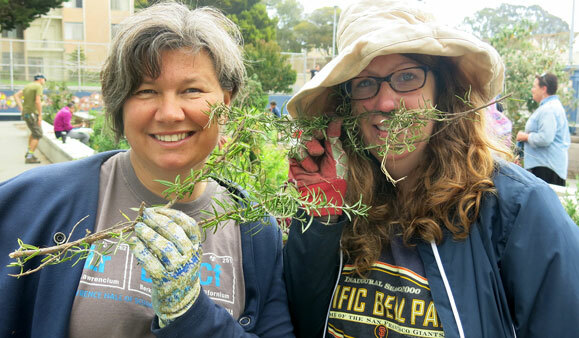 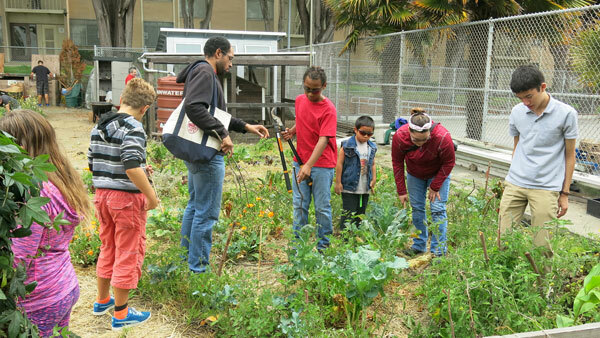 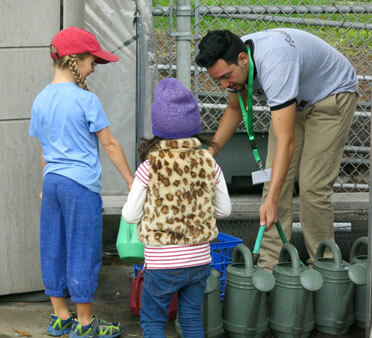 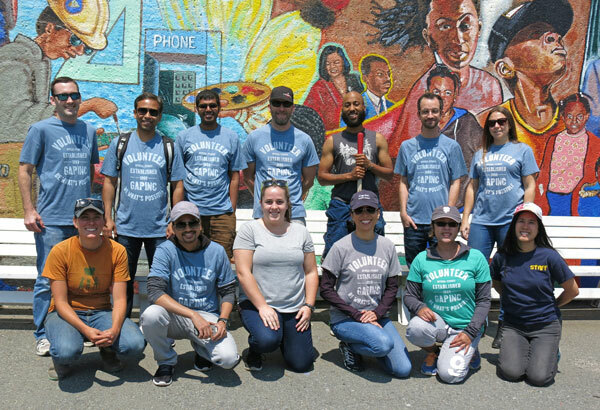 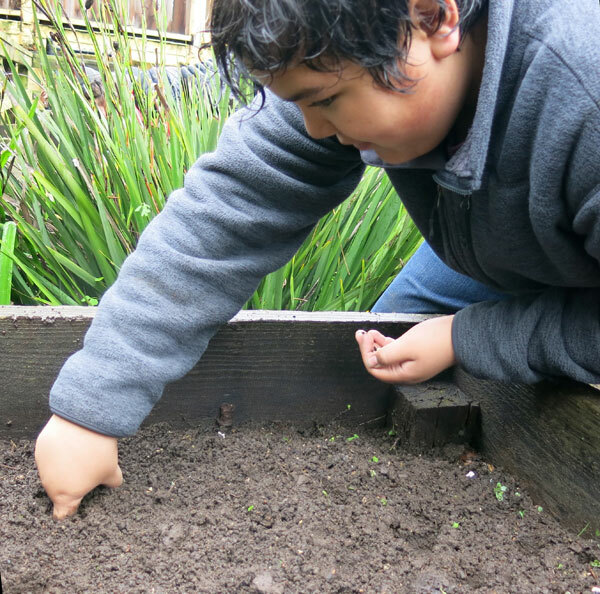 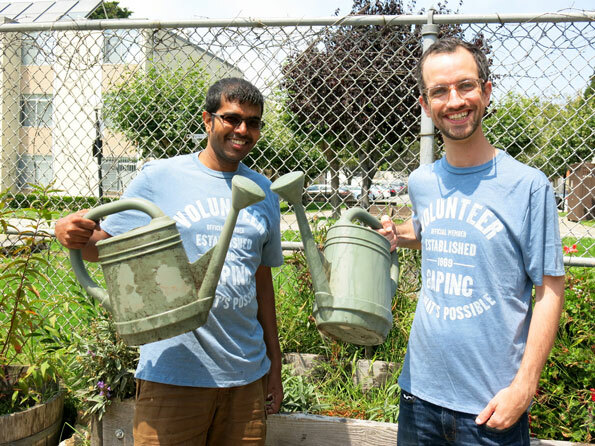 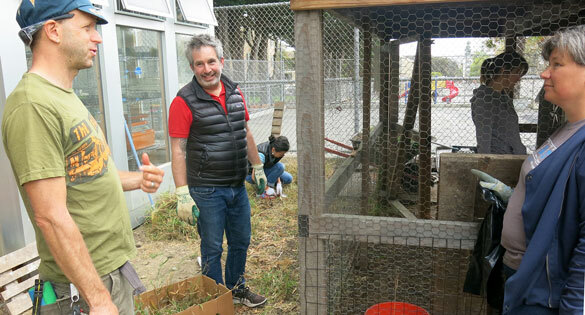 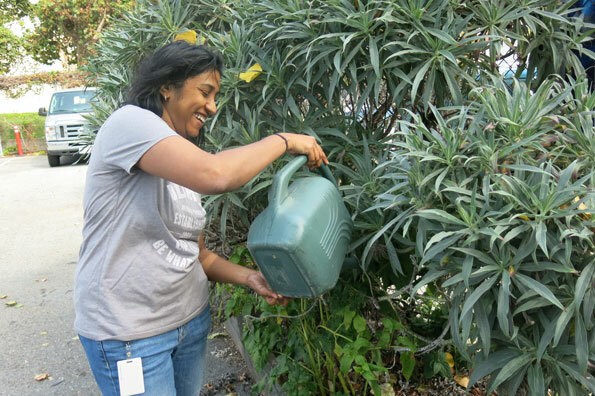 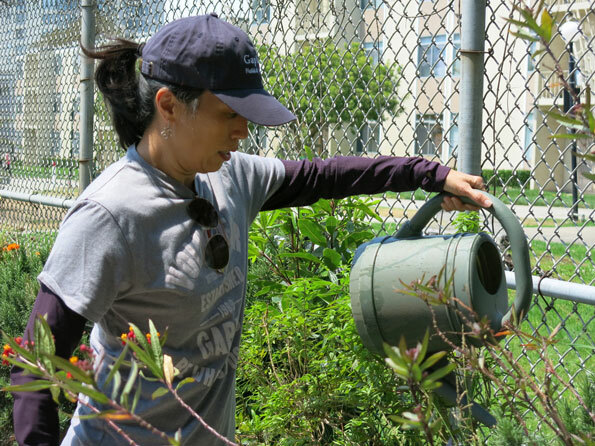 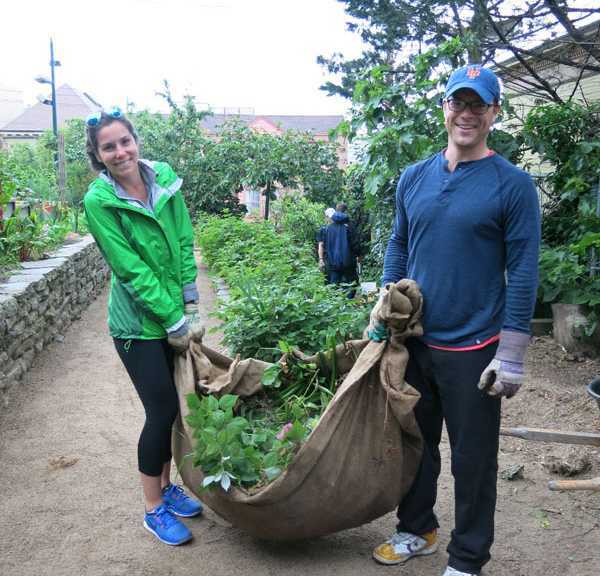 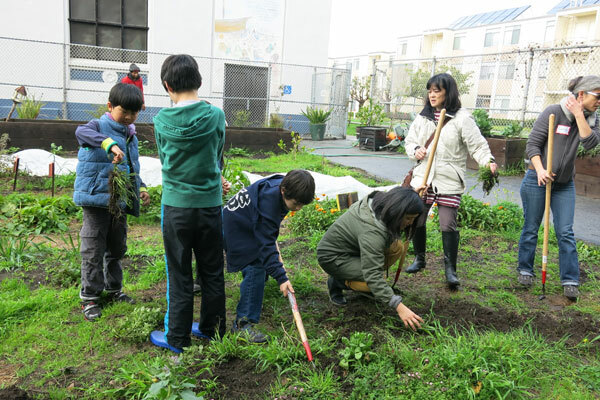 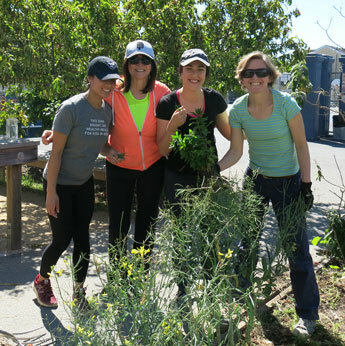 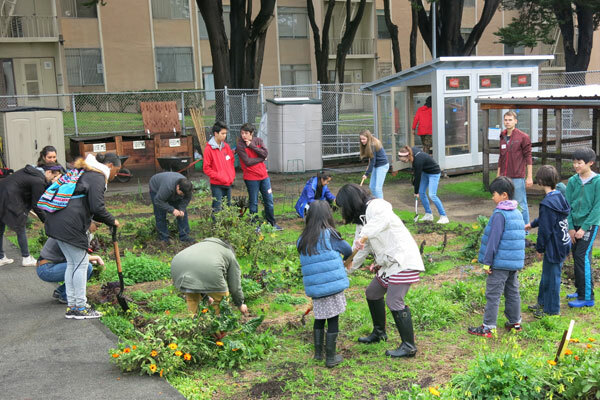 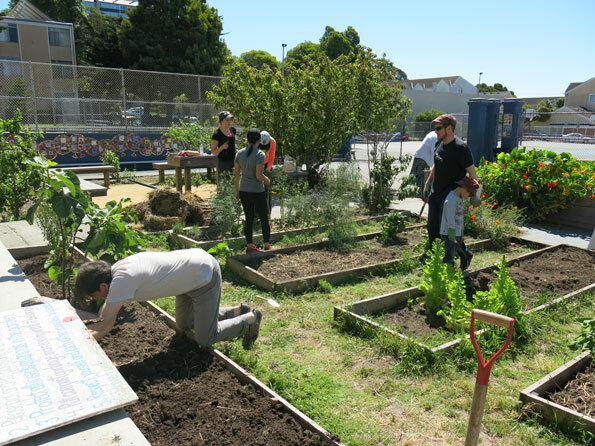 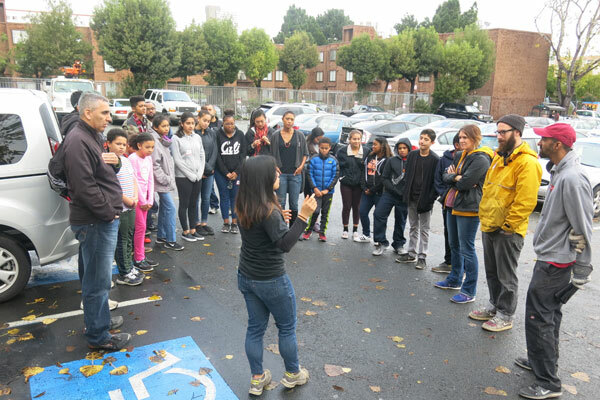 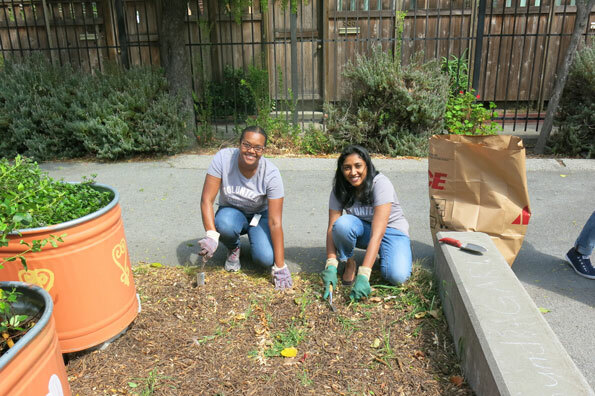 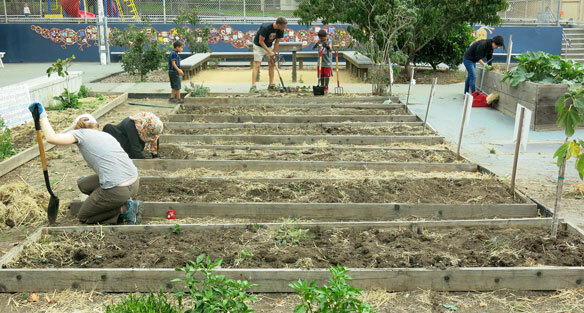 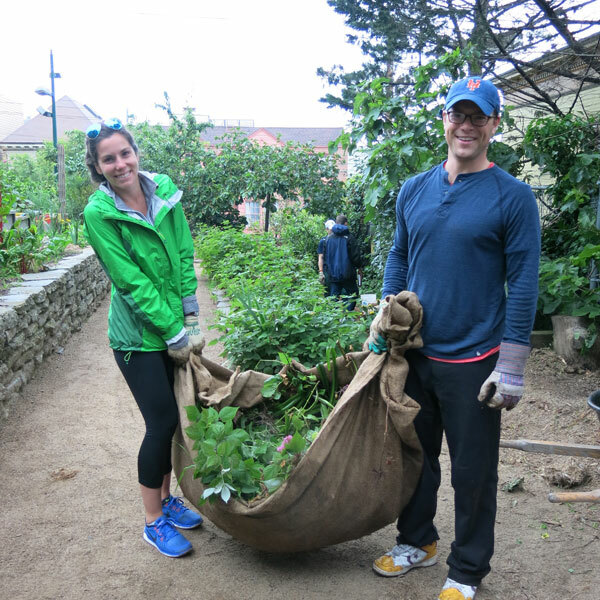 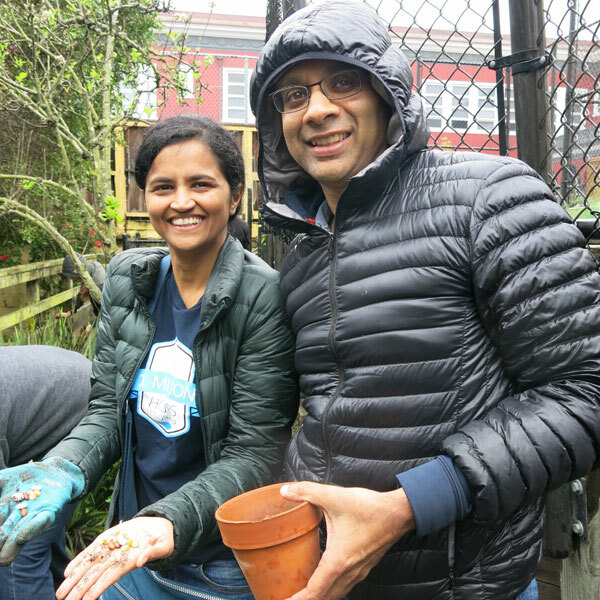 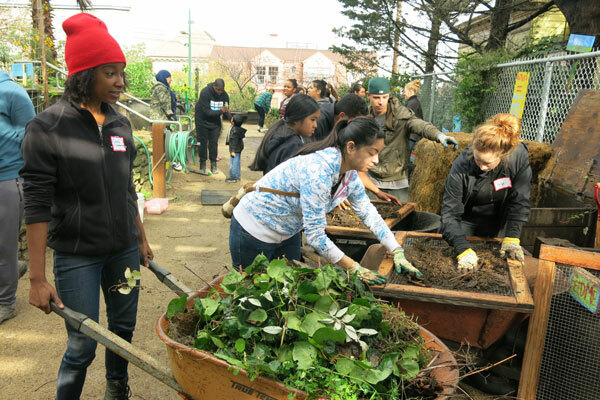 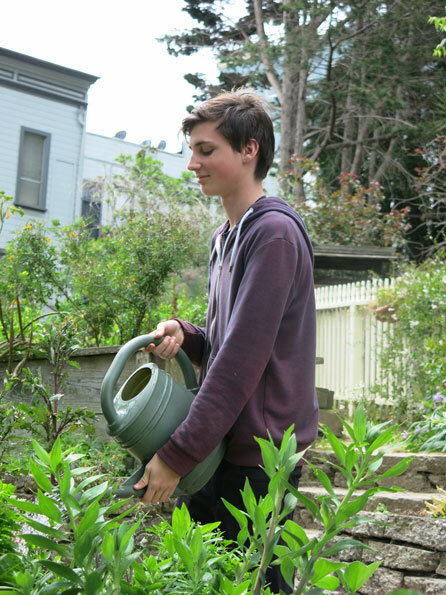 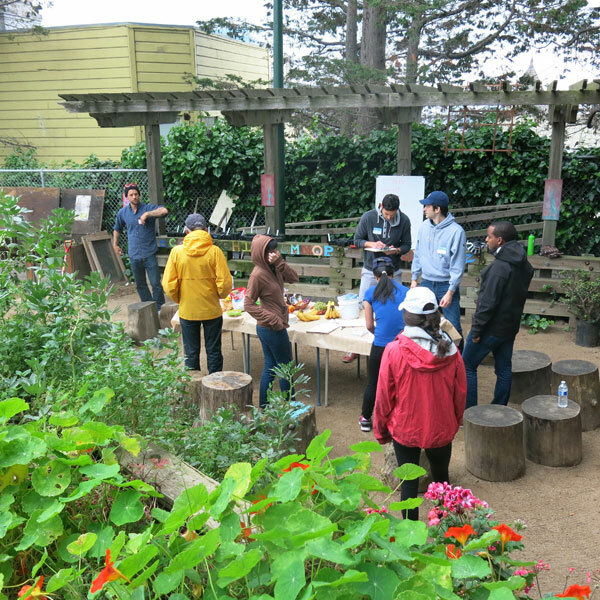 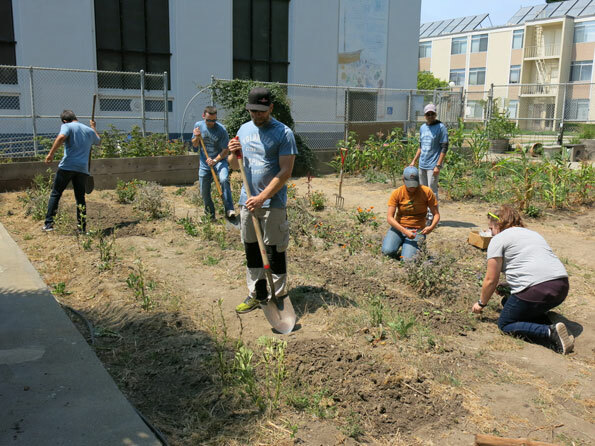 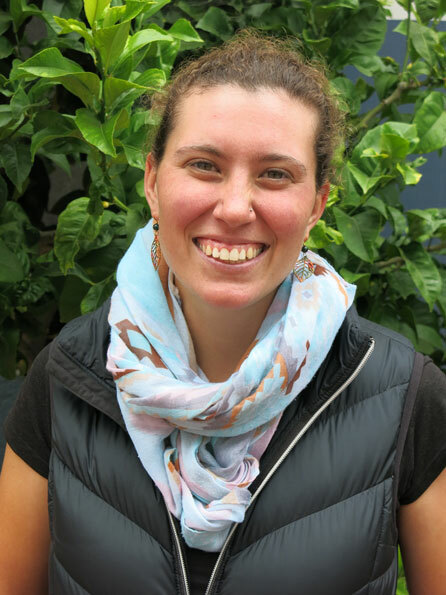 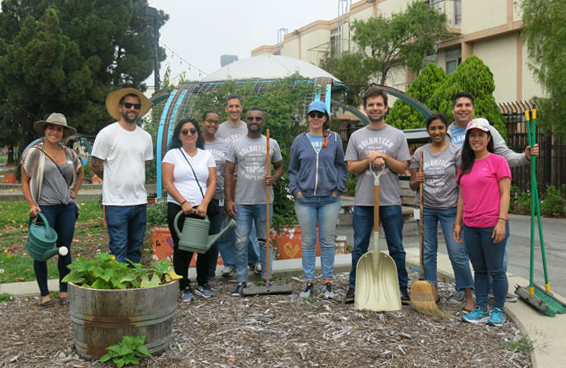 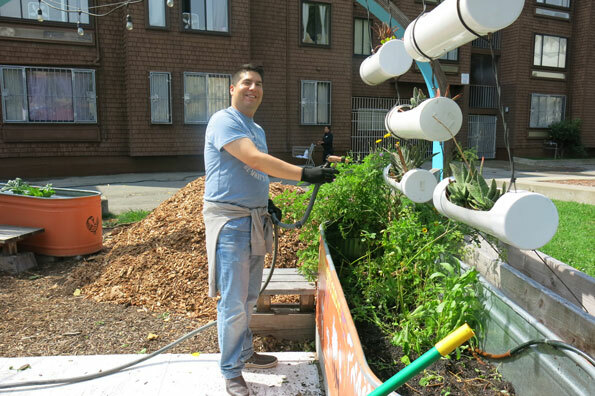 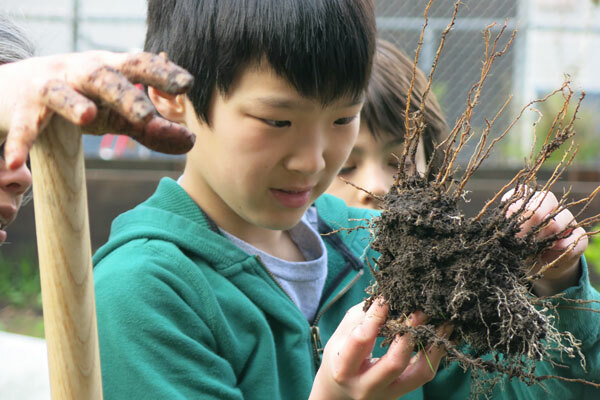 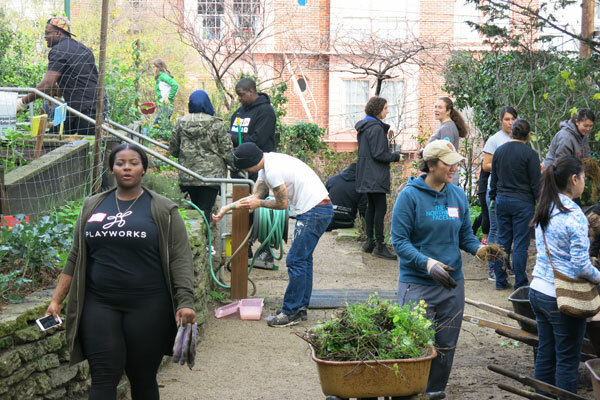 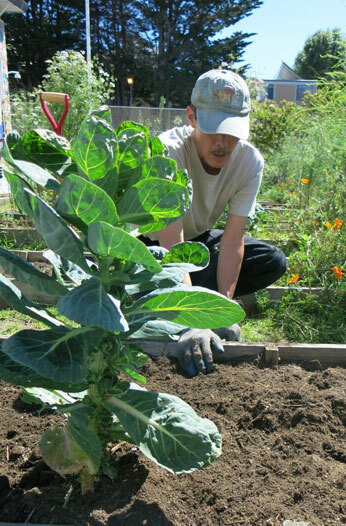 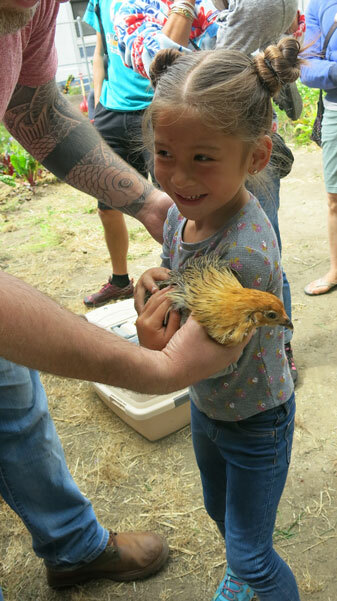 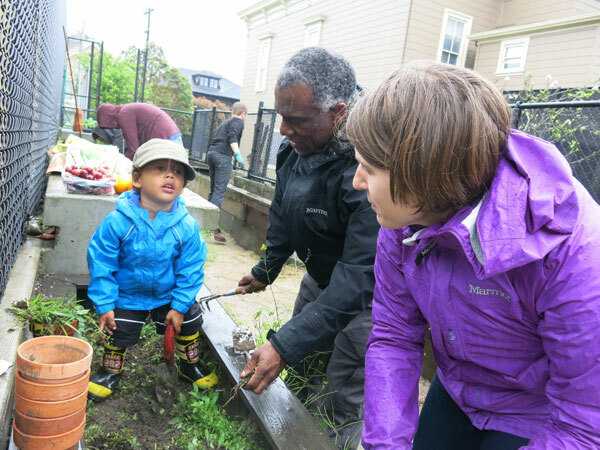 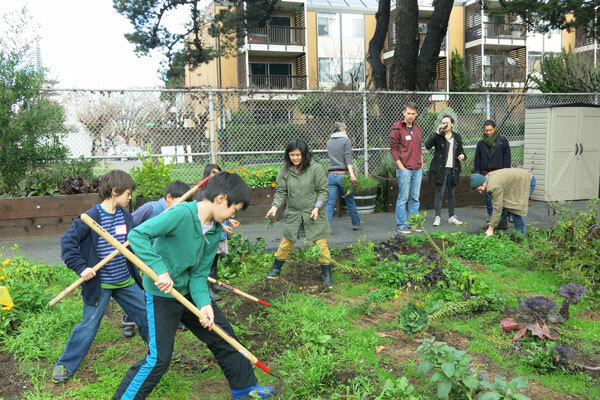 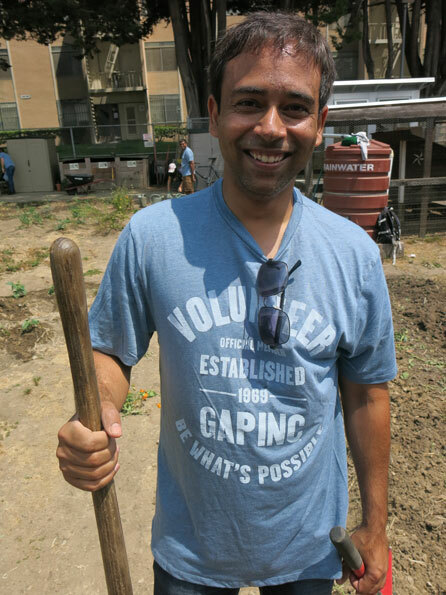 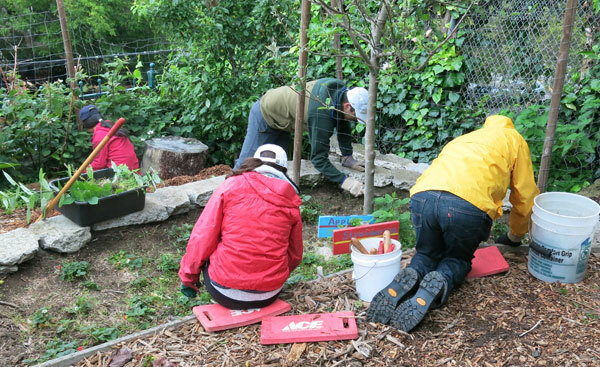 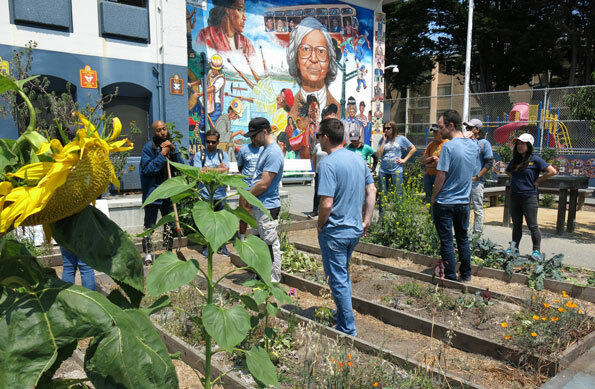 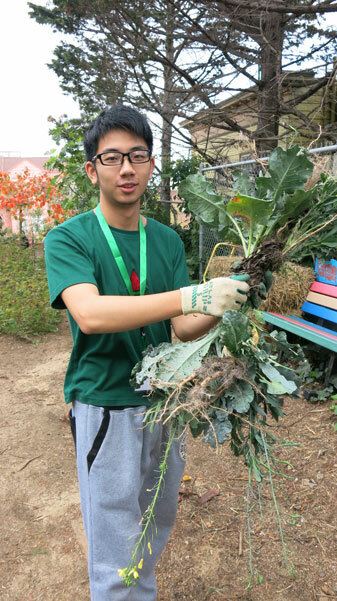 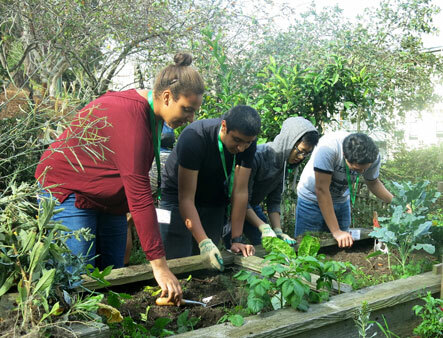 Then over 90 volunteers, many from the San Francisco Teacher Residency Program, Playworks, Lick-Wilmerding and University High School divided into three groups and traveled to three garden sites to work. 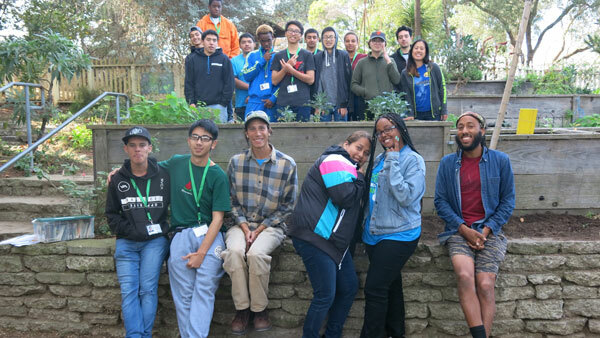 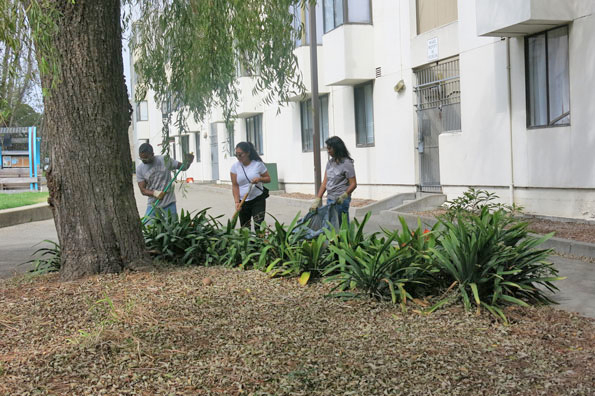 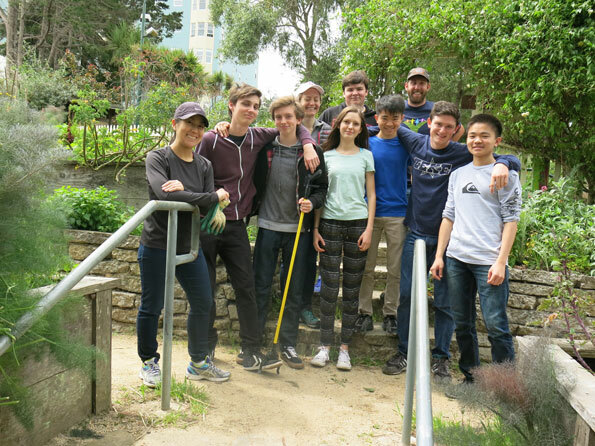 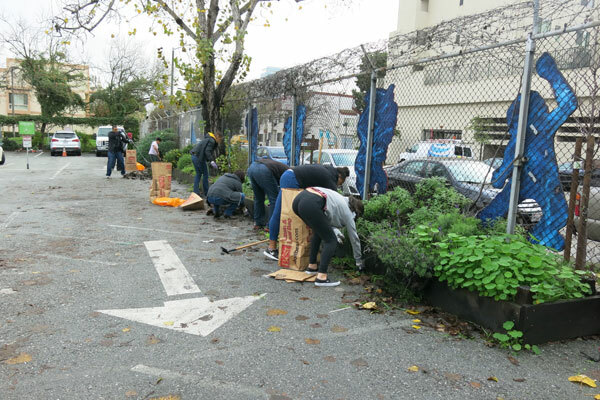 A group from Lick-Wilmerding under the leadership of CommunityGrows staff Kelly Ernst-Friedman and Melissa Tang, worked in the garden and parking lot of the AAACC picking up trash and mulching and gleaning the native plants. 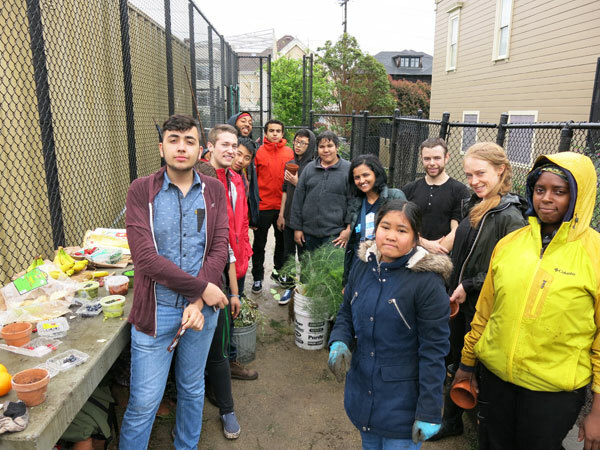 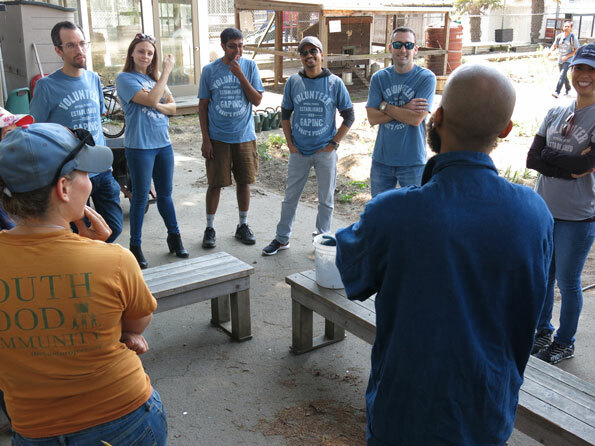 A large group from Playworks joined CommunityGrows staff Adrian Almquist, Crystal Jones, and BEET (Band of Environmentally Educated and Employable Teens) Jennifer Nazara to work in Koshland Garden. 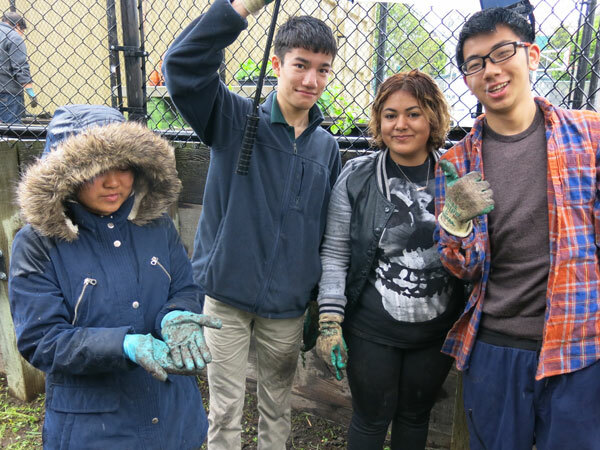 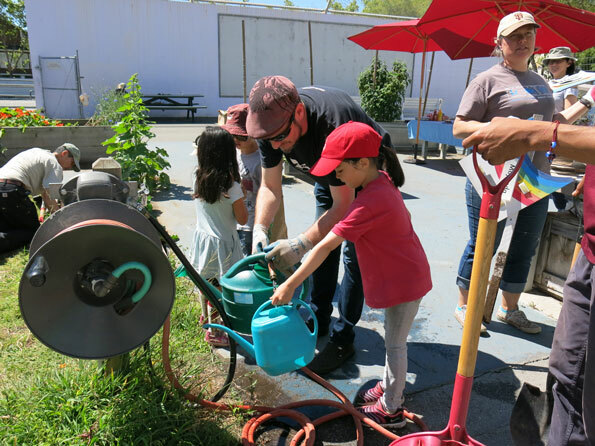 Another large group from University High School joined CommunityGrows staff Jay Jordan, Cha’Shay Woldridge and BEET Adrian Valencia to work at Rosa Parks Elementary School garden. 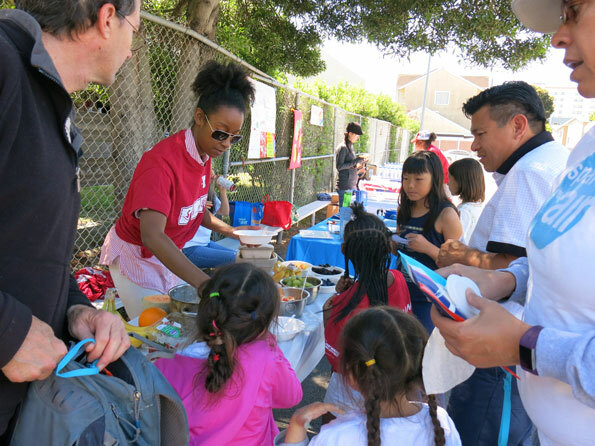 At the end of the workday morning, groups convened by at the AAACC for a delicious lunch and BBQ. 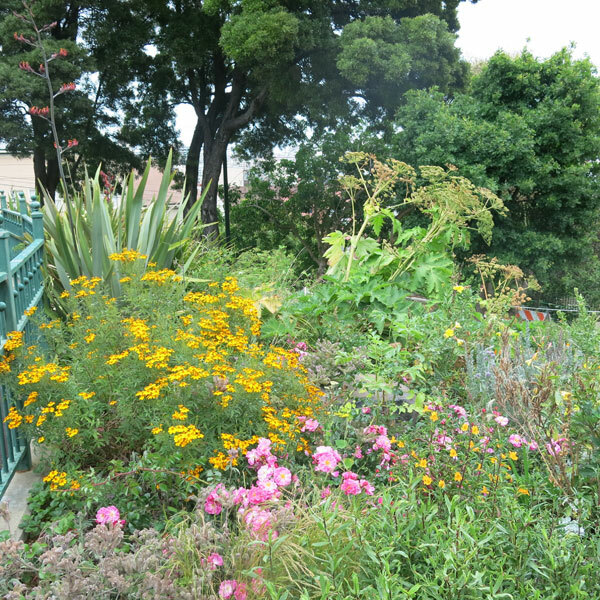 So much good work was done to make these gardens and spaces shine. 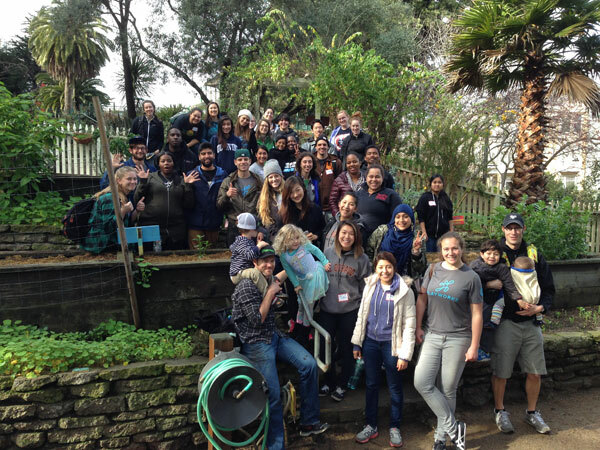 All the volunteers were awesome. 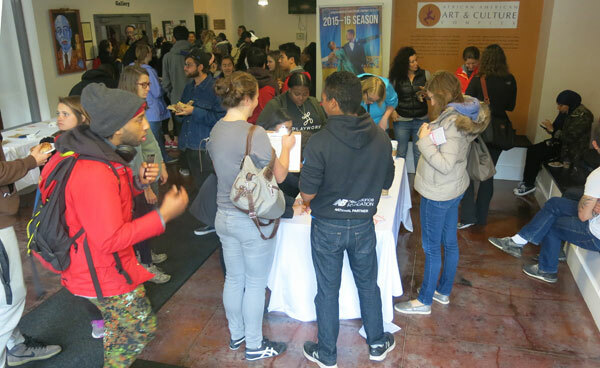 Thank you so much to everyone for this very successful day! 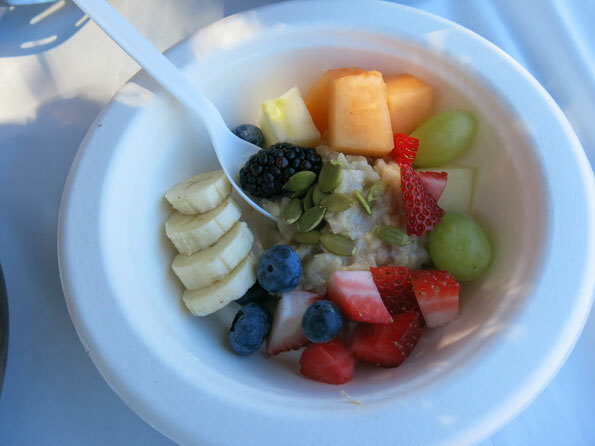 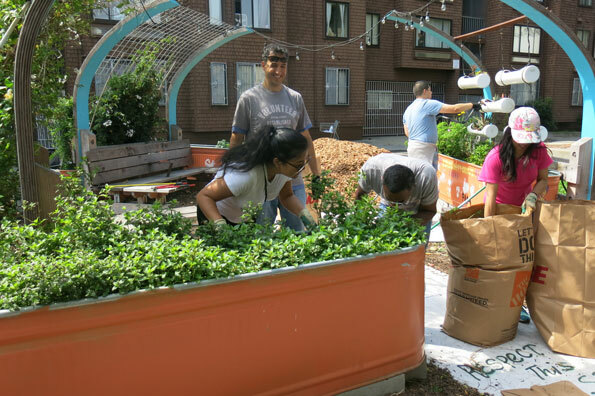 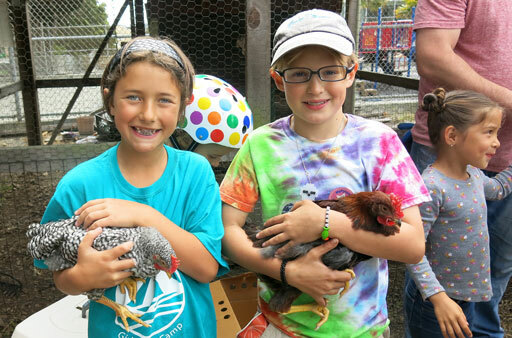 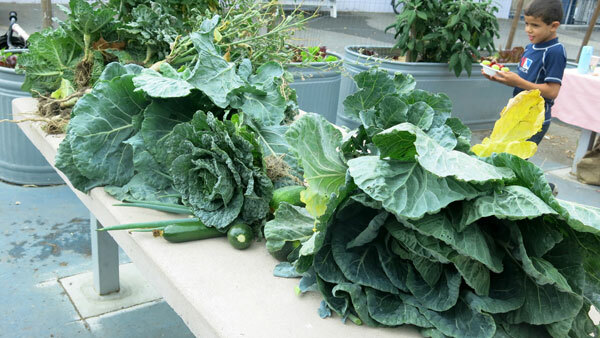 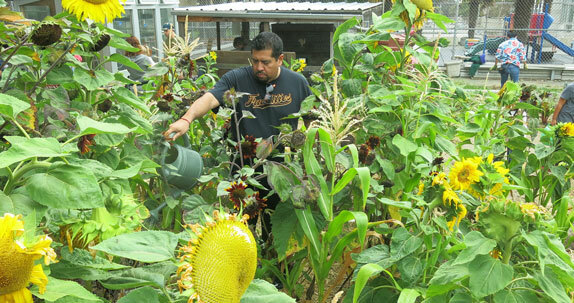 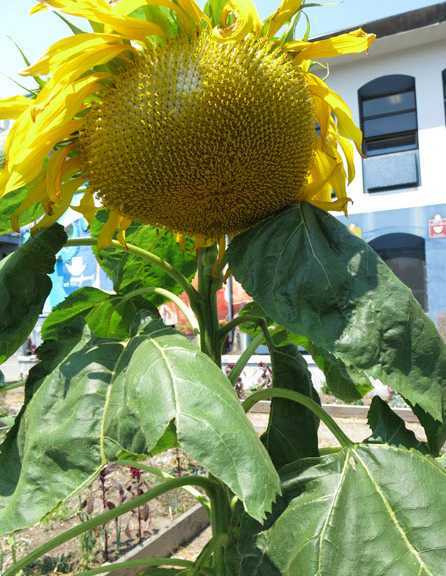 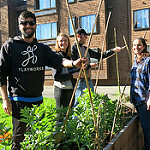 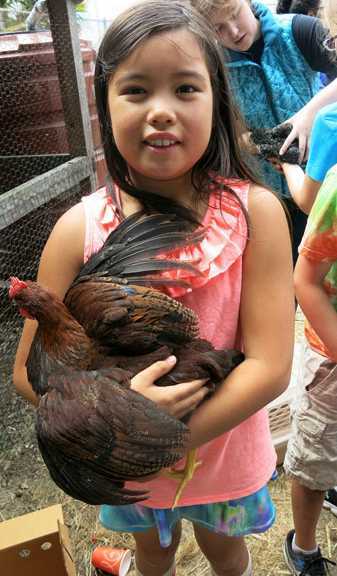 For MANY more photos check out our CommunityGrows Flickr Photostream.